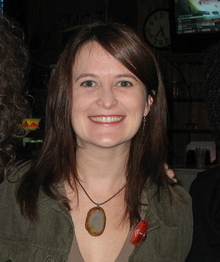 Tara Laskowski is the author of Modern Manners for Your Inner Demons (Matter Press, 2012). She is a senior editor at SmokeLong Quarterly. She earned an MFA in Creative Writing from George Mason University and recently completed a manuscript of her first novel, set in her hometown in Pennsylvania. She was the 2009 Kathy Fish Fellow at SmokeLong. Her fiction and nonfiction have been published in several places, most recently The Mid-American Review, Barrelhouse, FRiGG, The Collagist and Storyglossia. Her short story "Like Everyone Else" was published in Fiction Weekly and was a storySouth Million Writers Award notable online story in 2009. Another story, "Hole to China," was nominated for a Pushcart Prize. indeed, Tara, the SLQ artwork was perfect!! Damn, "Little Girls" looks perfect on SLQ. Loved it when I read a draft on the naut and love it even more now. Great job. I really appreciate the feedback. I haven't worked on this in a while, so the initial "fervor" is gone. I think I have to go back and make the changes, maybe having the son play a more minor role, still taking stuff, but maybe by accident having the box of letters. And starting with the narrator relating some clues to he and his wife's life together, how he thought they had a perfect life, and then to find out she might have had someone else but he'll never really know. Yeah, I'm feeling it. thanks Tara for the words on the Gratcher. Thanks...that piece remains homeless. There must be a hole in it that I'm not seeing. Thanks, Tara! He's Leo. In addition to the number of charming services he provides as a cat, his photogenic mug makes for an excellent avatar. I'd recommend him to you, but yours is quite nice already, and it seems you have some feline writing buddies of your own, as well. (Loved this interview: http://artandliterature.wordpress.com/2009/03/18/ten-questions-for-tara-laskowski/ ) Cheers...and [a belated] congratulations, too! Hi Tara, thanks for your kind note. Kudos on the 09 Fish Fellowship! That's awesome. She's one of my favorite writers. Has anyone ever told you that you look like Holly Hunter? You do! there she is. invite art so he doesn't fuss. I'm out of invites (I think). You must log in to write on Tara Laskowski's wall.